Eight days after Nino Farina's victory in the inaugural World Championship race at Silverstone, Juan Manuel Fangio, who was to dominate the sport for the next seven years, eased to a win in a race marred by a first-lap pile-up. Fangio qualified on pole and that proved vital as he was able to avoid the carnage behind him, caused when Farina skidded on the part of the road soaked by the sea at Tabac Corner after a manic start. In the resulting melee, eight others were put out and by the end of the second lap only nine of the 19 starters remained and the tracked was soaked in spilt fuel. Only Fangio and Luigi Villoresi escaped the chaos, but as Fangio came round again he became aware of yellow flags waving. "The spectators … were not looking at me leading the race but the other way," he said, and instinctively raised his hand to warn drivers behind him of the danger. Arriving on the scene, Fangio found the track blocked and fuel spilling everywhere along with marshals desperately trying to clear the area. He leant out and gently nudged one of the crashed cars out of the way and continued. Villoresi and Alberto Ascari followed but none came close to catching Fangio who finished a lap ahead of Ascari. Villoresi was forced out with a seized axle which allowed Louis Chiron to take third in his Maserati. Only seven of the 15 starters finished the three-hour-13-minute race. 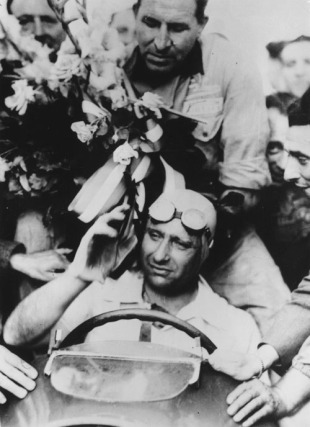 Fangio's victory was overshadowed by the injuries sustained by his friend José Froilán González. González had damaged his car in the melee but had carried on, unaware that his fuel cap had been dislodged. As he braked for a corner soon after fuel sloshed into the cockpit and seconds later ignited. He leapt from the car and rolled over and over on the track, aided by spectators who ripped his burning shirt off. Another Argentinean friend of Fangio's, Alfredo Pian, had also crashed and sustained a badly broken leg during the practice. In a remarkable footnote, Fangio, who was due to race a week later in Monza, spent three days tending for his colleagues. He then had the seats removed from his Alfa Romeo road car and drove Pian to a orthopaedic hospital in Bologna. 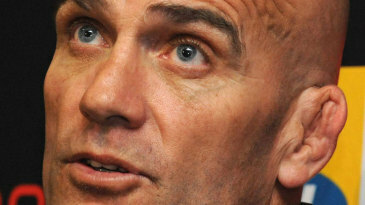 He then returned to Monaco and took González to a specialist burns unit in Italy. Harry Schell's Cooper was the first rear-engined car to start in a championship race.